As healthcare delivery systems have evolved, in part due to incentives in the PPACA, the need for anytime- anywhere access to patient health information has grown exponentially. Doctors may see patients in several different locations, from the satellite offices of a main facility, in community health centers, in schools or at the workplace for health screenings, even in mobile health clinics. While the drive to adopt electronic health records is well underway, mobile health (mHealth) implementation has lagged. In a 2012 survey of healthcare professionals, 91% indicated they were interested in adopting mobile EHR technology, specifically to document patient encounters, review and update charts, and prescribe medication. While the marketplace responded with a variety of mobile EHR applications (Apple's iTunes store currently has about 120 EHR apps for iPhone and iPad, for example, some native and some propriety apps from computer-based EHRs), physicians are still hesitant to adapt the technology. According to a report released earlier this month by MedData Group, only about six in ten physicians are using any type of mobile application, and of those who do use mobile apps, the majority are using them only to research medication interactions and diagnoses. 19% use mobile apps to access the EHR. 17% use mobile apps to order or review lab and imaging tests. 16% use mobile apps for charting. 16% use mobile apps for ePrescribing. Why Are Physicians Hesitant to Use mHealth Technology? Over 70% believed the technology was too costly. Nearly 60% believed the technology was too limited to address their needs. 55% believed physicians in their practice were too resistant to change. 25% believed their patients would object to the technology. At the Fourth Annual mHealth World Conference in Boston, representatives from the Cleveland Clinic discussed the successes and failures of their massive mHealth rollout. Chief among them was choosing the correct device. In the beginning, the clinic chose small laptop computers, but providers complained of the long start time when they used the devices on home visits, and simply stopped using them. They next tried ten-inch tablets, which proved unworkable because they couldn't be held in one hand. Ultimately, they settled on seven-inch tablets and iPhones because they could be slipped into a pocket, fulfilling a major requirement of mHealth technology: Portability. Another challenge for providers using mHealth technology is data entry. Fighting the keyboard on a touch screen proved to be too frustrating for many providers, causing them to ditch the technology. IT departments experimented with various workarounds, discovering that providers were willing to use keyboard attachments. The most popular solutions, however, were cloud-based applications that integrated a voice recognition function, streamlining the cumbersome process of entering information from remote locations. Improved time management. Secure text messages can be sent to remind patients of the date, time and location of appointments, including any special instructions for tests such as fasting blood sugars. Patients can confirm or cancel appointments via secure text responses. Improved continuity of care. The patient's entire health record, including test results and imaging studies are available at a touch. Secure video conferencing and file sharing with consulting specialists enable better clinical decision-making from remote locations. If your practice utilizes satellite locations, community outreach clinics or mobile healthcare activities, choosing an EHR with mHealth capabilities can improve your patient and provider satisfaction, as well as your bottom line. 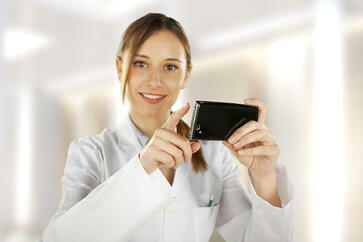 When you're ready to implement the right mobile EHR, RevenueXL has the products and features your practice needs.